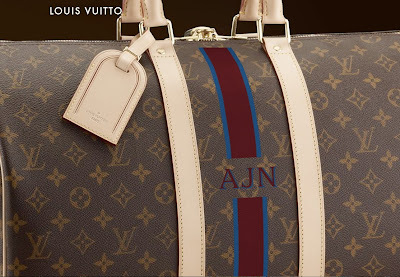 More on Mon Monogram at Gay List Daily. Yes, entire libraries have been written about the psychology of consumer desire, but it's still amazing how some objects incite such lust. You can keep the bag; for me it's leather jackets or the sheet metal of certain cars. My first memory is from about age 17, when I worked at a country inn in Vermont and saw a red Porsche in a cottage driveway. The car had fenders jutting over the wheels, glowing cherry paint, and say your Freudian-cigar-or-mother's-milk whatever I admit being struck with a sharp pain in my chest. I had a crush on a piece of steel. I have no answer as to why some objects make us want them so badly (with the irony being it is the longing we cherish, because once we buy leather coats they end up in the closet cause they're rather heavy and uncomfortable). Evolutionary psychology blames it on our need for shelter; Geoffrey Miller says we do it to signal to others. Dunno. Maybe we don't desire objects; we instead desire *desire,* because longing for that which we can't have validates the truth of the emptiness inside of us. Or, it could just be a damn fine bag. Maybe it's less the desire or the item than the dream associated with the mastery. I like to think it means a lot to own Manolo Blahnik shoes because here, on your feet, are the life's work of a person who, as a child, fantasized about his mother shoes and drew pictures of them across the kitchen floor, investing a permanence, a rich importance, into the seductive curve of a foot. How many shoe producers have that conviction? Porsche is the same way. That timeless design is the result of who-knows-how-many discarded sketches. Every time I see one I want to lick it, and I'm already imagining what the buttery leather will feel like inside. God, to have the mind that made the Porsche.